This light and airy unit has been completely renovated and professionally decorated by Wiseman, Gale, and Duncan Interiors of Santa Fe. 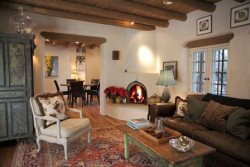 Done in spirited Santa Fe style it is the most charming unit in the Fort Marcy complex. Featuring a kiva fireplace, beautiful hand plastered walls, hard wood floors, heated bathroom floors, custom cabinets, and hand painted tiles, this 2 bedroom 2 ½ bath unit can easily accommodate up to 6 people. The balcony on the upper level with access off both bedrooms features wonderful views of the city as well as western sunsets over the Jemez Mountains. This unit also features an ASKO washer/dryer, stereo and sound system throughout, 3 flat-screen TVs, a colorful intimate dining area, and many interesting Mexican and Guatemalan vintage textiles and antique pieces. 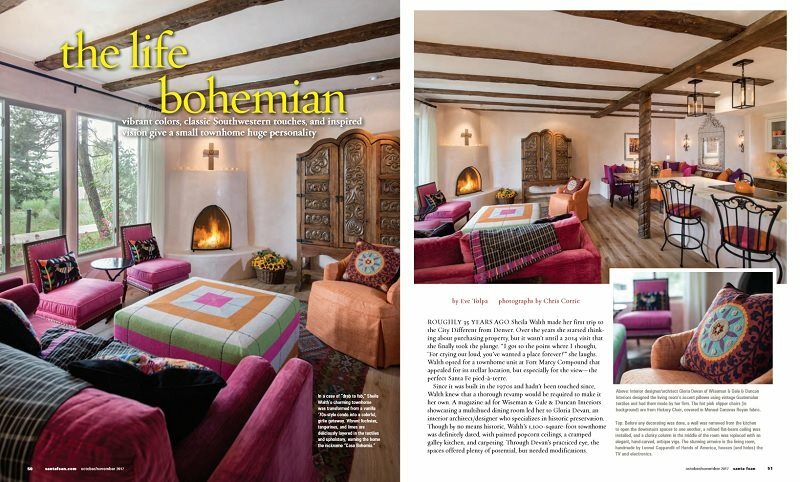 The designers had the guest in mind and included absolutely everything to make your Santa Fe visit a memorable one. Very nice to work with over the phone. Again, we just absolutely loved it!